Only a few more days until Halloween! I'm sure by now most of you have finalized your plans for Saturday night. If you haven't and have no idea what to do, why not throw a house party? 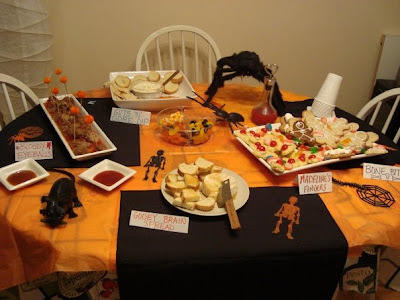 I had some friends over last year and had so much fun decorating and preparing. It doesn't take a whole lot of time AND Dollarama (aka the best store ever) has such a great variety of decoartions. Lady Fingers - for the nail your best bet is to use an almond but if you have nut allergies (like me) you can use maraschino cherries. Don't forget to put in a few lines around the knuckles to make it look more like the real thing. Gingerbread Skeletons - just make a regular gingerbread man and then draw in some bones with white icing. Gooey Brain Spread aka baked brie with whatever you want to spread it onto. Delicious. Bloody Eye-balls - meatballs in some sort of red sauce. I used a can of stewed tomatoes to make it look more like blood and guts. Plus the tomatoes were seasoned with Italian spices so it added to the flavour of the meatballs. I won't lie, I can't read what I wrote on the sign in the very back and I've forgotten what exactly the dip actually was. I think it might say "guts and gore dip" but just use whatever you want for dip and give it a gross name. All of the decorations on the table as well as the orange tissue paper all came from Dollarama. The black napkins I already had.